Though the near term headwinds do exist, the Indian economy is in far fettle if you compare it with the days when we were categorized amongst ‘the fragile five’ way back in 2013 when similar conditions of depreciating currency, high oil prices existed; these emerging market economies were branded as ‘fragile five’ being too dependent on unreliable foreign investment to finance their growth ambitions. Today, Indian economy is one amongst very few economies growing upwards of 7% every year but has contained inflation and twin deficits (though rising crude oil price is a concern for short run). Important reforms that would take care of both assets and liability side of the country’s balance sheet are in place and delivering, albeit at slower pace than expected; the leakages are plugged and work is in progress to make the economy stronger to weather such eventualities. Overall, though the markets have corrected by more than 10% from the all time highs made recently, the business environment is running strong, the corporates (barring few viz. NBFCs which would be impacted due to liquidity issues in near term) are expected to deliver robust growth driven by consumption led demand. Three consecutive good monsoons coupled with better MSPs have helped the agrarian community improve their spending power and therefore the consumption; it must be noted that the rural consumption, growing at double the pace of urban segment is driving the growth. Spends by the Government of India on building better infrastructure, amenities etc. have been improving. Non-food credit growth is off its lows and has hit 4 year high of 13.6% in fortnight ending Aug.31, ’18; total credit off-take is up by 12.4% driven by personal loans (including credit cards), housing and non-food credit, but the credit to industry is growing marginally by a little less than 2%. Retail participation in Indian equity markets is rising; despite the correction in equity markets, the net inflow in mutual funds has been increasing despite outflows by FIIs. The net inflow into equity MF schemes (including ELSS) was reported at Rs 11,172 cr in the month of Sept.’18 (approx. Rs 90,000 cr in 2018 YTD); the money flow in systematic investment plans (SIP) is also stable and seems to be sticky in nature. Going forward, we have political heavy calendar ahead starting with 5 state elections in Nov.-Dec. 2018 and general election somewhere in Apr-May 2019; the government at centre with new mandate would be in office by June 2019. The markets are expected to be range bound till clarity emerges on political front but this is going to be a never before opportunity for investors irrespective of which party forms government in May 2019. 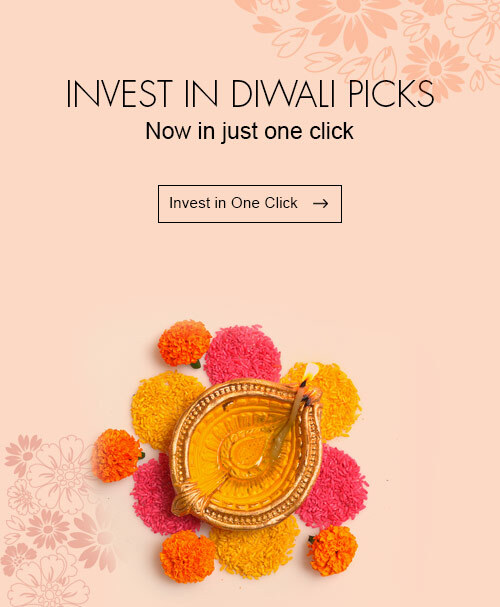 We would suggest the investors to use the opportunity given by the correction in the market to load up on the marquee growth oriented stocks backed by proven management, some of which are included in list of our Diwali picks. Over the past few years Axis Direct Muhurat Picks have outperformed the Benchmark indices. Overall, the picks for Samvat 2074 (barring 1 stock idea), had not only reached the target prices but moved up further. In Jan 2018, we had accordingly informed our investors about the same. However, in the last two months, the stock prices have corrected sharply eroding all the wealth created following the volatility and risk aversion in the markets. CMP as on 23rd October, 2018.